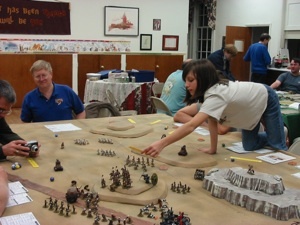 The HAWKS – short for Harford Area Weekly Kreigspielers – is a gaming group located in Harford County, Maryland*. The group meets on 1st and 3rd Friday nights in a church hall in Aberdeen, Maryland, near the US Army’s Aberdeen Proving Ground. The HAWKS are active participants in the HMGS East Conventions and are the hosts for BARRAGE, a one day wargaming convention, each September. *Contrary to popular assumption, we are not located near Hartford, Connecticut.